Art and Soul Oakland Festival, originally uploaded by in2jazz. OAKLAND, California (June 16, 2005)—The City of Oakland is pleased to announce headliners for the 5th Annual Comcast Art & Soul Oakland. Blues Traveler, led by the inspired singing and harmonica playing of John Popper, is back in top form. As evidenced by their latest Live on the Rocks CD, Blues Traveler plays with plenty of fire, loads of solid improvisation and tons of funky blues jamming. They continue in their tradition as a glorious jam band, but have become more focused, exuding tremendous musicianship. This fall Blues Traveler will release their 8th studio effort ¡Bastardos! on Vanguard Records. Blues Traveler headlines Sunday’s show sponsored by KFOG 104.5 FM/97.7 FM. The 5th Annual Comcast Art & Soul Oakland is Northern California’s most accessible festival offering direct service from BART and free parking for thousands of cars. 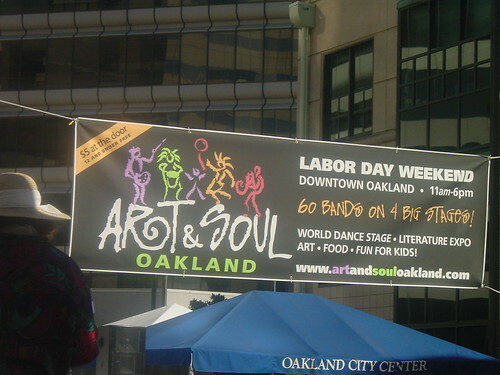 Last year 60,000 people enjoyed three sensational days of music, food, fun and art in beautiful downtown Oakland. This year, in addition to the KBLX stage on Monday, the festival is adding an all-jazz stage on Saturday with Frankye Kelly, Michael O’Neill featuring Kenny Washington and Babatunde Lea, whose soulful African inspired jazz has made him one of the hottest acts on the national and international touring circuit. The Bay Area Blues Society’s ever popular three-day Blues Stage will expand to include Cajun Zydeco on Saturday, featuring Platinum selling artist Maria Muldaur & Her Louisiana Hot Band in addition to Tom Rigney & Flambeau (A Bay Area native, Tom is the son of baseball great Bill Rigney). Also new this year is an LGBT stage on Sunday featuring Latin jazz group Orquesta d’Soul, the nationally-recognized all-female African American rock group Sistas in the Pit, and other great local artists. To honor its fifth anniversary of bringing art & culture to the heart of Oakland, Art & Soul invites festival-goers to meet the new downtown Oakland. With thousands of residents pouring in as Mayor Jerry Brown’s 10K Initiative reaches fruition and scores of new restaurants, nightclubs and cultural venues generating great buzz, downtown Oakland is happening. This year’s festival will include an interactive “Meet DowntownOak.com” booth featuring exhibits, prize drawings and a VIP concierge service for post-festival (and beyond) dining and entertainment reservations at various downtown hot spots. A family paradise, Art & Soul boasts the largest Family Fun Zone of any festival in the Bay Area, complete with amusement park rides, children’s entertainment and free admission for ages 12 and under. Art & Soul also offers hundreds of artisan booths and an eclectic array of food vendors reflecting the rich cultures found in Oakland—America’s most diverse city. The festival also proudly presents the Oakland Literature Expo, spotlighting the Bay Area’s literary heritage and authors, and the World Dance festival showcasing some of the region’s hottest ethnic dance troupes. The 5th Annual Comcast Art & Soul Oakland takes place in downtown Oakland on Saturday, September 3rd, Sunday, September 4th and Monday, September 5th from 11AM–6 PM. The festival is centered in Frank Ogawa Plaza and City Center, encompassing 10 city blocks. Admission is $5.00 per day at the door; 12 and under free. This headliner announcement is a partial list. More headliners and supporting acts will be announced soon. For more information on the 5th Annual Comcast Art & Soul Oakland including vendor and sponsor opportunities, log onto www.artandsouloakland.com or call (510) 444-CITY. This entry was posted on Saturday, July 23rd, 2005 at 5:24 pm. It is filed under Art & Soul Oakland. You can follow any responses to this entry through the RSS 2.0 feed. I wondering is it to late for stagebridge to join this years festival and how are groups selected. Let us know about next year.